The Sixteenth Hole is a challenging Par 5, partially up hill with a slightly hidden green. 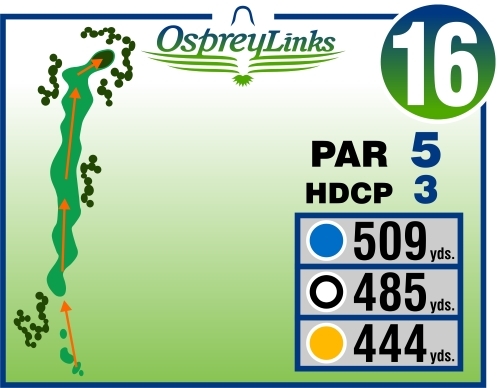 Lots of room to hit the driver off the tee, but a small outcropping of trees bordering the right fairway and a tongue of the Canadian Shield licks the same side of the fairway demanding long hitters keep it straight. Your second shot demands accuracy as trees tighten both sides of the fairway which is also beginning to elevate to the green. The green is tucked well against the bush line to the right and is protected by sand. Hitting the green in two is difficult and given both its proximity to the woods and its tiered nature, might not be worth the risk. Better to play your second shot safe and position yourself for a shot pitch making sure you get the ball to the proper tier and as close to the pin as possible.